In this recipe: dark chocolate, whipping cream, honey, vanilla extract, nibbed cocoa beans. Preheat oven to 180°C. Combine cream, butter, sugar and honey and bring to a boil, then pour over the cocoa powder. Mix all the ingredients together. Place heaped teaspoons of the mixture onto a parchment paper lined baking sheet and spread to form disks. Sprinkle with nibbed cocoa beans and bake for 10 minutes. Remove tuile rounds from baking sheet while they are still hot and place them immediately into a rolling pin to form a slightly curved shape. For the ganache, finely chop the chocolate and place in a bowl. Bring the cream and vanilla to a boil then pour over the chocolate whisking gently until the mixture becomes smooth. Refrigerate for 30 minutes until the ganache has set. Line a baking sheet with parchment paper. 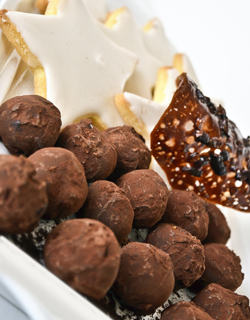 Sing either a teaspoon or a piping bag fitted with a round tip, make small balls of ganache on the baking sheet. Refrigerate for 20 minutes. For the coating, fill a shallow dish with cocoa powder. Wearing rubber gloves, roll the balls between your hands to make the balls well rounded. Use a fork to roll the balls in the cocoa powder, coating them evenly. Then transfer to a fine mesh sieve and shake gently to remove any excess cocoa. Place each truffle into a small paper case. For the shortbread dough, use your fingertips to rub the butter and flour together until the mixture resembles fine breadcrumbs. Make a well in the center. Add the remaining ingredients and combine. Use the palm of your hand to smear the dough across the work surface to blend. Shape the dough into a ball, flatten it slightly then dust lightly with flour. Wrap in plastic wrap and refrigerate for 30 minutes. Preheat oven to 170°C. Roll chilled dough out to a thickness of 5 mm. Cut out star shapes, place on a parchment paper lined baking sheet. Bake for about 12 minutes; cool. For the glaze, mix together the powdered sugar and water to form a smooth thick consistency, then mix in a few drops of lemon juice. Spread glaze over cooled shortbread stars. You can keep the truffles refrigerated for 1 week on a plate filled with cocoa powder, before rolling them completely in cocoa and placing in paper baking cases.